Sources are in the zip file and in github. /me grabs it to try it out in the next design binge. You sir are my hero!! I just balanced my RCS of most of my crafts to pixel precise accuracy in less than a minute. I then did a quick test with one of the crafts and rcs is perfect, going up/down left/right means no unwanted rotation!! You... made a man cry. This is... perfection!! Thanks alot, this plugin is priceless for me! BTW, would this be possible to adapt it in some way so to be able to show the shrinking center of mass thing depending on which object I select in VAB? Say I want to have my center of mass be in the perfect center of my main fuel tank, I would select the fuel tank as being the reference object and whenever I would add things then the CoM would get smaller the more closer from the center of the fuel tank it would get. That way if I would endup having the CoM be almost invisible, I would then know that my vessel is balanced on the fuel tank (meaning that emptying the fuel tank wouldn't shift the CoM, thus keeping the vessel balanced at all times during flight). Thats a nifty little plugin! Is there any chance you could provide some other maybe numerical cue to indicate the balancedness of the vessel? Because what I have seen from my quick spin I gave it is that the center of mass gets really small to a point where you cant see it but it is still there. Actually knowing that is is zero would be fantastic rather then having to second guess the placement. Also what the guy before me said. That would make your plugin even more compelling! Tried it out. Damn, having that just a week ago would save me a LOT of pain when docking yesterday. Looks brilliant, will definitely give this a try. Thanks! So far, it works just like it says on the tin! Now to see how it behaves with increasingly complex designs. Just in case I'm going to point that the thing that is getting zeroed is the torque force, the shrinking CoM is a gimmick I came with since otherwise the arrow will sink inside the sphere and you couldn't know if is getting smaller or bigger. I'm not sure if it is what you want but you can do something similar if you do the process backwards (ie, place the RCS thrusters first and build the vessel last) I mean, you put your orange tank or whichever as first part, place the RCS thrusters, check there's no torque force, and then build the rest of the vessel. As you add parts the CoM will move and a torque force will start showing, this time around instead of repositioning the RCS thrusters you will have to move parts around for keep things balanced. But I think that trying to keep things balanced will only work for a vessel with one tank only, since fuel is always consumed one tank at a time unless you start transferring fuel around things will get unbalanced. With mono-propellant since it's consumed in all tanks equally you can solve the unbalancing by placing tanks in pairs and in symmetry, not so with liquid fuel. You can't make the torque force disappear, you can't make it zero exactly. If you can't see the CoM then the torque magnitude is really low, like below 0.09. Anyway trying to get almost exact to zero is worthless because your ship will get outside of that value the moment you burn some fuel. ...Where was this all my life? Just wanted to say, I love you for this. I was OK at thruster placement but thanks to this even my huge refueling ships handle extremely well. Something like this needs to be implemented as stock alongside the Center of Mass/Lift/Thrust visuals. This takes a lot of the guess work out... Thank you, thank you, thank you! Thanks heaps this is a great tool and easy to understand. Ahh, great idea didn't thought of that! I went and built a new craft the way you suggested and it got balanced on the main tank from start to finish, excellent !! Indeed I try to build with symmetrical fuel tank placement. Usually one main tank with 2 connected on each sides, so when placing the RCS right after putting the main tank, I could get the secondary tanks centered on the main so that when they emptied, they kept the CoM centered on the main still ! Awesome!! The suggestion about being able to see the actual value would be nice but not necessary. Just would make it easier to know if what you are doing is actually helping or not especially when the CoM ball becomes so small that you can barely see it anymore. But then again, at that point it probably isn't making that much of a difference in the overall stability, but maybe it would be nice to have for the purists out there who love numbers . A quick note, the plugin appears to calculate parts that are not connected to the craft. 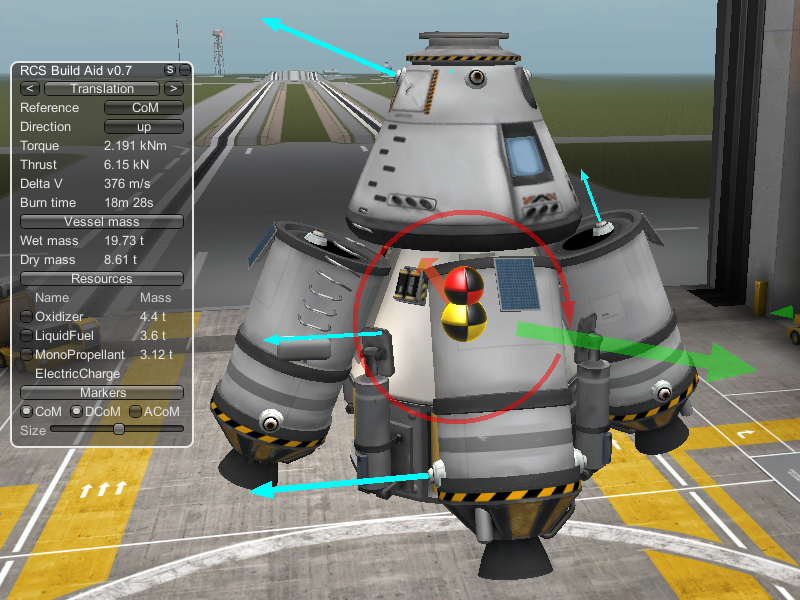 ex: have some fueltank with rcs thrusters on it and you disconnect it from the craft and leave it there in a corner of the VAB while testing a different setup, it will calculate the parts that you put away even tho they are not connected to anything anymore. Cheers and grats again for this great plugin!! I notice that parts are still considered for torque calculations even when they're removed from the main vessel, i.e. they're semi-transparent red in the VAB. It would be really nice to be able to detach my launch vehicle, adjust my RCS torque, then re-attach without having to use sub-assembly loader. Very cool idea. I'll give this a try tonight. Sounds like TAC Fuel Balancer is going to be particularly helpful for maintaining balance in-flight! Just wondering: if I use this then want to see only my CoM again, can I just press space until the arrows dissapear and then the CoM will reappear in it's original size? This is one of those mods you always needed but never knew till its in front of you! This is brilliant. I am soooo happy with this! I tend to launch a lot of large and/or oddly shaped payloads. Some of my builds contained 600+ units of monoprop, and needed every bit...for ops in Kerbin SoI. My solution to crazy builds has always been 'More jets! More mono!' but no longer. I tested this by launching and docking my 2 main orbital station cores. A lot less mono was used...ALOT!! Docking was much more fluid and took about half the time! Thanks for this, going on the MUST HAVE list for sure! A bug report, if I may. When attempting to balance a craft that includes S2 cockpit from the B9 pack, initially vectors for the cockpit's builtin RCS thrusters were displayed, but were incorrect. After a while, they stopped showing up altogether and now I can't get them to show at all. They are apparently not counted anymore either, got no clue why. There is nothing that appears relevant in the logs. I have needed this for so long! I've been using this a s a rudimentary CoM balancer, by placing linear RCS ports about the centre stack in symmetry, this plugin will show minimum torque when the mass is lined up with the centre. This means that I can asymmetric vehicles with central engines, and have them not torque around much. This is a brilliant mod!